Kim Anderson, Circulation Assistant (summer). Board of Trustees, 2009: Front, Jo Morse and Bess Hanson (ret). Back: Sarah Heath, Chuck DiCecca (ret), Helen Heiner (Chair). The Board of Trustees. The Trustees meets on the 4th Monday of each month at 5:00 pm at the Library. Consult minutes of monthly meetings. Our current board is Helen Heiner (Chair), Lynn D. Allen (Secretary), Sarah Heath (Treasurer), Karin Karagozian (at large), Shannon Whalen, Bette Miller (alt), Susan Gurney (alt), Annette Nichols (alt), Jo Morse (alt). You can consult minutes of monthly meetings. Historical note: In November 2005, The Nichols Memorial Library Association, the original governing body of the Nichols Library, disbanded. 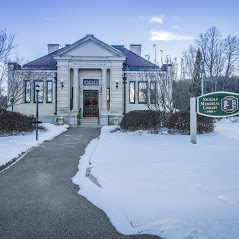 The Library became an entity of the Town of Center Harbor and Trustees became elected officials of the town.